In the middle of the 6th century a monastery was founded here by St Colomba, the monastery is famous for an illuminated manuscript, written here in the 7th century, known as the Book of Durrow. 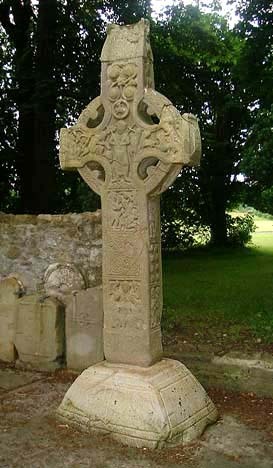 West of the Church is a fine High Cross, the East face is pictured on the right, the head features Christ with sceptre and cross -staff, associated with the last judgement, and on his left a piper and David with his harp. On his right David and the lion are depicted. The bottom of the shaft on the East face shows the raised Christ flanked by two angels hovering above St Peter and St Paul. 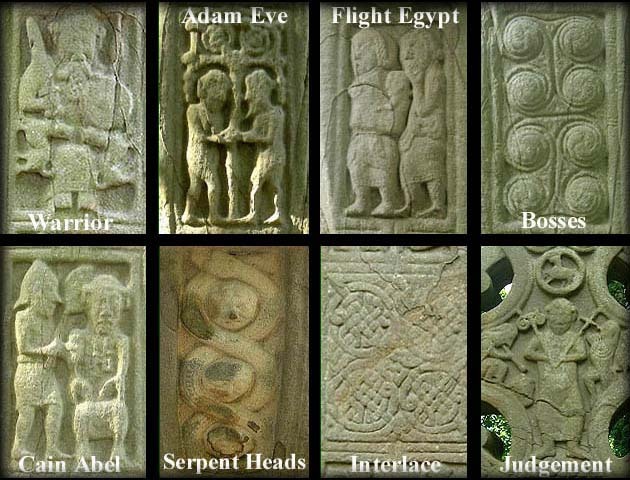 The central panel is a beautiful celtic interlace and the top panel bears the sacrifice of Isaac.The west face as usual has the Crucifixtion on the head and also the arrest of Christ. This is a fine cross standing at 3.60 metres. In spring 2004 the government bought Durrow Abbey and High Cross. It was vital that the High Cross was protected from any further deterioration. Near the cross are some 9th-10th century cross slabs, one of which is shown above. The Church is on private ground and the Cross and Slabs are surrounded by large trees. Above is a selection of panels from the High Cross, The warrior with plaited beard and two dogs is on the south side. The iconography showing Adam and Eve and Cain and Abel are also on the south side of the shaft. The Heads with the interlacing serpent are under the ring on both the north and south sides. The Flight into Egypt is immediately below the eight spiral bosses on the north side of the High Cross. The last judgement and the interlace panel both appear on the east face. 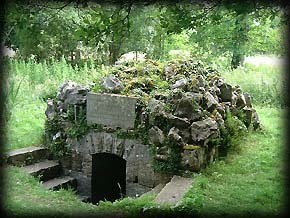 Situated about 500 metres north of the high cross is a holy well known as St Colmcilles well, above the entrance to the well, which has steps leading down to it, is a plaque with AD550 written on it. 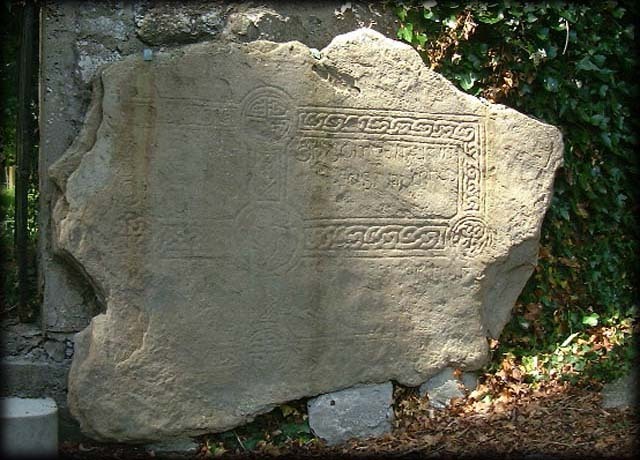 Situated: At Durrow Abbey 3 1/2 miles north of Tullamore. 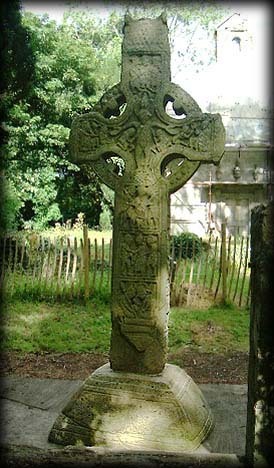 At Durrow look for the entrance to an estate with large wrought iron gates, it is sign-posted High Cross. After you enter the estate you will have a 300 metre walk until you come to the restored church on your right.